The secret to implementing an SEO strategy thatg works is to be thorough and consistent with your approach. I do a tonne of SEO audits for companies each year and almost every site is in the same condition when I first take a look. The SEO work is incomplete. Simple and mandatory on-page SEO is not done. In this article I am going to show you how to improve SEO quickly and easily. These are some of the basics of what I look at for an SEO audit and will help to increase organic search traffic to any site. Each item on this list is something that I believe you must do (mandatory not maybe…) in 2018 and beyond if you want to succeed and grow your audience. The first step to SEO and the most productive task you can spend time on is keyword research. I highly recommend trying out SEMRUSH. This is by far the best keyword research tool right now. It is super easy to use enables you to work efficiently. What used to take me days can now be done in minutes with their Keyword Magic tool. I have tried all the tools out and this is the only one that I still pay to use each and every day on an ongoing basis. Over the years I have worked with many well known companies and big brands. You would be surprised to know that few had been doing any form of keyword research. Most companies blindly hope for organic search traffic. They do not know if their audience is actually interested in the topics they write about. Or, they do not have the resources available and dedicated people to find out. This gives you and anyone who uses a keyword research tool an advantage. Doing a complete job on keyword research is definitely the most important and effective way that you can improve SEO for your site. Many people are scared off by the costs of keyword research tools. Don’t be. The information and data that you can extract totally pays for itself in the long run. Last year I more than doubled my organic search traffic to my men’s style blog by doing a fresh round of very detailed and relentless keyword research. I used the information to guide a brand new content strategy. Once fully implemented I was able to dramatically increase my display ad revenue. That was my primary goal. Now I do keyword research all the time. The SEMRUSH chart below of my organic search traffic demonstrates that continuous research and intelligence gathering pays off big time. Invest in a keyword research tool for at least one month and do all your keyword research. Or, use it as long as you need. Get to know your audience and what they are searching. Understand your product or service category inside out. Do not underestimate the power of keyword research. Aim for 1000 words minimum. The Yoast plugin recommends 300 words minimum but I can assure you this is not adequate. You will not get on page one if you do not write more than 1000 words. I have ranked pages on the first page with 750 words but my site does have authority and has been around for 5+ years. Why write long articles? There is a huge bonus to writing longer articles for SEO success. Longer articles produce higher rankings but more importantly they generate WAY more keyword searches. Think about the different possible outcomes of a shorter vs. a longer article about any topic. Scenario 1: You do an incomplete job and stop at 750 words. That means some relevant keywords did not make it into your article. Thus, you probably won’t be found for them. These missing keywords could be sub-topics, sub-sub-topics, synonyms, or LSI keywords. Scenario 2: You do an extra thorough job and surpass 1500+ or even 2000+ total words. You have addressed every single possible angle to your focus (seed) keyword and main topic. And then some! You have answered all questions completely and provided a thorough solution. Now lets assume that both scenarios delivered an average position in the top 3 rankings. That’s amazing! However, there is going to be a huge difference in the final results with regards to total organic search traffic. You will be rewarded massively for putting in the extra work and writing longer articles. Your keyword visibility is going to multiply by sticking to a scenario 2 strategy. From a simple statistical point of view the longer article that targets the exact same topic has a much higher probability of triggering so many more keyword searches. This is because a wider variety of keywords were used in your copy. Now we’re talking about keyword proliferation. Or is it topic saturation? You get the idea? Write longer articles and get hugely rewarded for pretty much the same task. Number 1 and 2 on this list of how to improve SEO are at the top for a reason. And they directly feed into and work with each other. Mandatory for top rankings in 2018. If you don’t do the work you won’t get the results. I know this is true. I have done it both ways. Since, the mid 1990s title tags have been one of the most important SEO ranking factors. They still are over 20 years later. Possibly more than ever. This is due to the rise of RankBrain a machine learning (AI) algorithm that Google uses to sort search results. RankBrain measures how people interact with search results. Your title tag or SEO title has a huge impact on how people view your listings. Google uses your title tag (SEO title), meta description and URL slug to create search results. Your goal is to increase click-through rates (CTR) by writing incredibly enticing SEO titles (and meta descriptions). 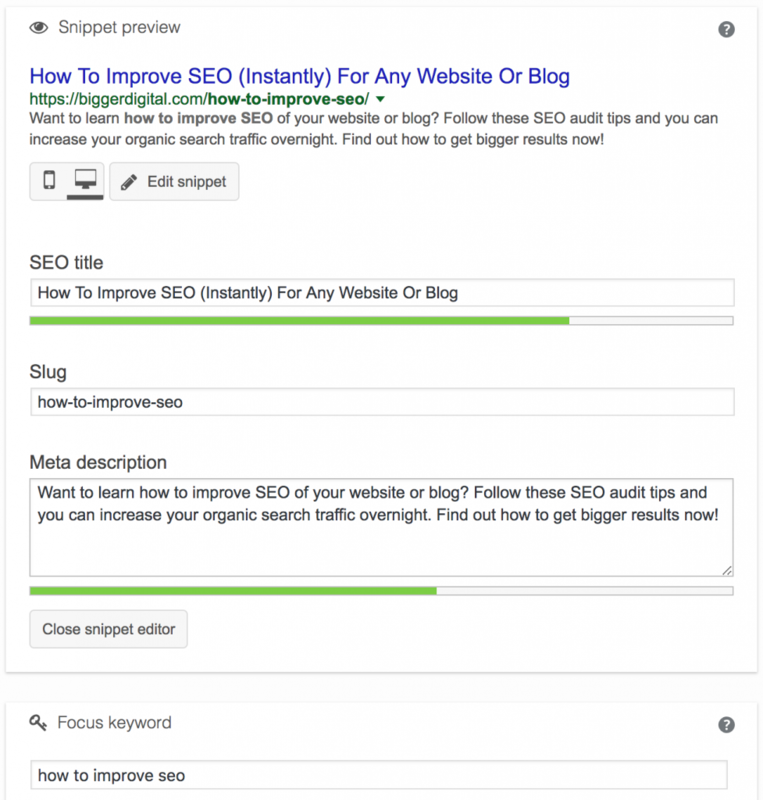 If you are using WordPress install the Yoast SEO plugin and edit your snippet for every single article that you write. Enter a focus keyword, a unique SEO title, a compelling meta description, and a short slug that has your keyword in it. Do not skip this. Make sure to use your focus keyword in the SEO title as soon as possible as I have done in the example below. If you want to improve your SEO almost instantly this is the easiest regular task you can do. Here is what I entered for this article. I am not going to go deep into the meta description. Just write something compelling and on topic. Use your most important keywords if you can because they get bolded in your listing when searched. Bonus tip: Review these other Yoast SEO settings to get the most out of the plugin. As of this week Google now only looks at the mobile version of your website. Desktop is history. Most web traffic is on phones. More than 60 percent. My men’s blog is more than 80 percent phone traffic. You must offer an excellent user experience (UX) for mobile devices. If not, you will drift away in the search results. If you are using WordPress make sure you are using a theme that is responsive design. Then you are golden. If you are not on WordPress, you might consider switching. I have tried many different WordPress theme companies. I only use Studiopress themes for my site. They are fast, secure, easy to customize, and great WordPress themes for SEO. If you want to instantly improve your WordPress SEO switch to a Studiopress theme. A mobile first strategy and providing top notch UX ties into RankBrain as well. First you need to get high CTRs with your SEO title and meta description. Next you need to keep people on your site and consuming content. Excellent UX is going to increase the average visit (session) duration, decrease bounce rates, and increase pages viewed. This satisfies RankBrain very nicely. Focusing on this will also improve your chances of landing (and staying) on page one of Google. If you think mobile first and superb UX you will get a long term boost in your rankings. We just emphasized the requirement to think mobile first if you want to improve your SEO. Fast page load times are part of thinking about your mobile/phone users. Faster page speed will increase your conversions and goals whether that be e-commerce, collecting leads or showing ads. More page views means more revenue. Do not make your users wait. It is very easy to achieve a page load time of under 2 seconds. Under 1 second is completely possible (if you are not serving ads). How do you increase your page speed to improve SEO? Featured snippets appear above the regular organic search listings. Some are referring to featured snippets as position zero. As I write this article…let’s take a look at an example. Circled in red is the featured snippet. In time, I hope that you will see my article as the featured snippet. I am fairly certain that I am providing a better, more complete, and up to date answer to the question and search query “how to improve SEO”. Featured snippets are a huge opportunity to gain additional visibility. The position might be even easier to acquire than the traditional number 1 position. How do you rank for featured snippets? This may be the least known tactic on how to improve SEO right now in 2018. Implementing a solid internal link strategy can be very productive and help you improve your SEO quickly. How can you implement a strong internal link structure? If you want to know how to improve SEO for pages that are ranked on page 2 or 3 this a way to do so quickly. You will get nice organic search traffic bumps particularly for pages ranked at the top of page 2 or bottom of page 1 by improving internal link structure. Create some internal links pointing at these pages from your pages already ranked higher. Use relevant, diverse and longer tail keywords for anchor text. I highly recommend using WordPress and the Yoast SEO plugin if you want to make SEO improvements. One great feature is the readability score. Keep an eye on this. I have noticed that my articles that have a high readability score (green) rank much higher in Google. How do you improve your readability score? Do not hit publish until you have a green readability score. 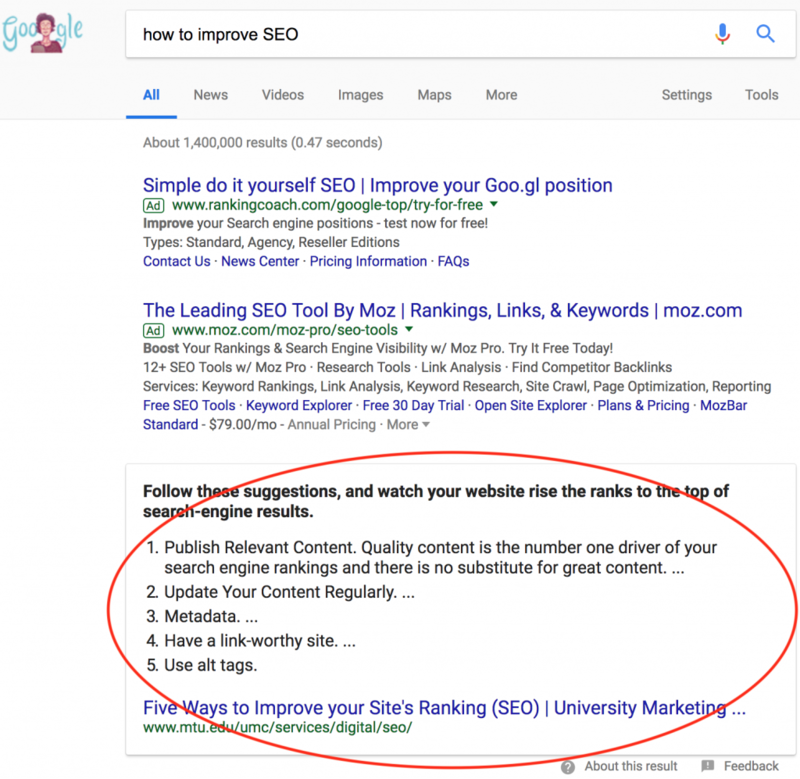 This is such a simple and totally underrated tip on how to improve SEO for any site. Super easy. There has been debate on whether or not social sharing signals impact SEO. Based on a plethora of experiments, I believe they do positively impact organic search rankings. I built, own and operate a website that has had 50+ million visits in the past 5 years. In a number of ways I have instigated social sharing of my content. Some articles have been shared over 100,000 times! It has been my observation that articles that have been shared more do perform better in organic search. Certainly, some pages that have been shared less (1000s of times) also rank well. The more activity and engagement you can create for any page on your site is a good thing for all your SEO efforts. More activity will propel and give power to everything we have discussed in this article. HTTPS is a ranking factor and must do for 2018. It will have less of an impact over time as everyone moves over to HTTPS. Nevertheless important. Why is this important and how will it improve your SEO? When you are browsing in Google Chrome you will notice a green padlock and the word Secure beside some web addresses. Here is what it looks like for my site. The alternative is not so enticing. It will turn people away. This will definitely not satisfy RankBrain since it will lead to a higher bounce rate, a shorter visit duration, and less pages viewed. None of that is good for SEO. Your site will slip slide away down the rankings in organic search. Cloudflare makes it very easy to implement HTTPS for your site in a number of ways. I am not going to get into the details in this post but I would like to leave you with a golden nugget to explore on your own. Put some time into cracking Pinterest. It’s pretty big these days. Use as many images as you can in your content. Backlink to key page URLs. Boom. That concludes my top 10 checklist on how to improve SEO for your blog or website. If you put the time into implementing this checklist in a thorough and consistent manner I guarantee that you will see quick improvements and get way more organic search traffic. Make this the basis of your SEO process and stick to it! If you are just getting started please be sure to read my how to start a blog article. It shows you step-by-step in detail how you can launch a brand new site on WordPress the right way. Very important for SEO success.